Heating and cooling your facilities can account for the largest portion of your electric bill. Research indicates that HVAC operating costs can be reduced up to 35% when air filters are changed out regularly. Changing your filters regularly is the single most important thing you can do to help your HVAC systems operate at near peak efficiency. Systematically changed HVAC filters can save equipment downtime or prevent minor problems from becoming major repairs. At Sonitx we not only save you money with a timely filter service, but often we can combine smaller pleated filters into our larger rigid aluminum framed electrostatic filters allowing more filtration using less filters. Additionally, in our arsenal of environmentally friendly filters we install a patented line of pleated filters that have been shown in testing by a national grocery store chain to reduce energy cost by 5 cents per square foot of retail space! On average one ton of air conditioning costs $60.00 per month to operate. If your filters are not being changed on a regular basis, that $60.00 will eventually turn into over $90.00 per month. 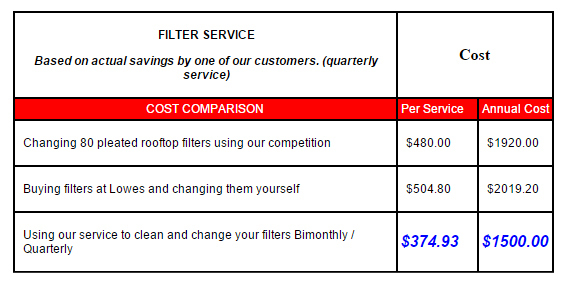 Using our service filtering that unit only costs around $3.00 per month. NEGLECTING YOUR FILTERS WILL EVENTUALLY COST YOU TEN TIMES THE COST OF SIMPLY KEEPING THEM SERVICES REGULARLY! And that's not even considering the added costs of unnecessary breakdowns and service calls! On top of the energy savings many times our cost will be far less than your going to a hardware store and buying the filters yourself. See the example at the bottom of this page for actual filter savings at a big box retail store. Cutting filter service is not a way to cut costs. Cutting filter service INCREASES costs.